For non-profit use only, please credit the videographer. Charles Moehle, Probonophoto. Filmed at rally in front of the Hall of Justice for San Mateo County in Redwood City, CA on February 11, 2019. Chinedu or CV as he was called by close friends was the youngest of five siblings born to Nigerian immigrants. Educated at Morehouse College, he received a degree in business administration. He was a truth-seeker and truth-speaker, as often expressed in his poetic artistry. He was also loved as a son, father, brother, and friend. 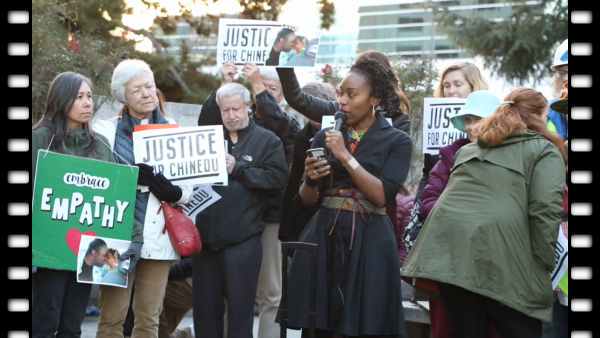 On October 3, 2018, Chinedu Okobi was unarmed and walking down the sidewalk when San Mateo Country Sheriff deputies approached him in Millbrae, Calif. He asked, "what did I do," and sheriffs responded by tasing him to death.